This Jeweled Garden Disney Princess Bed Set will keep your princess snug as she drifts of into fairyland for a good night’s sleep (hopefully!). The primarily pink and white color pallette of this bed set is decorated with floral detailing based on a palace garden blended with the all the royal glamour of a princess’ jewelry. The bedspread features a motif that reads “I Believe in Fairytales”. If you choose a white bed for your little princess’ room, this bed linen will add just the right amount of pink to give you the look you want. This set includes a reversible quilted bedspread, a fitted sheet a flat sheet, one pillow case and one sham (twin size) or two pillow cases and two shams (full size). The bedspread is 60% cotton and 40% polyester. 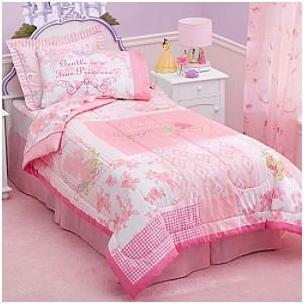 This Disney Princess Bed Set is available at 40% discount (at time of writing) at Amazon.